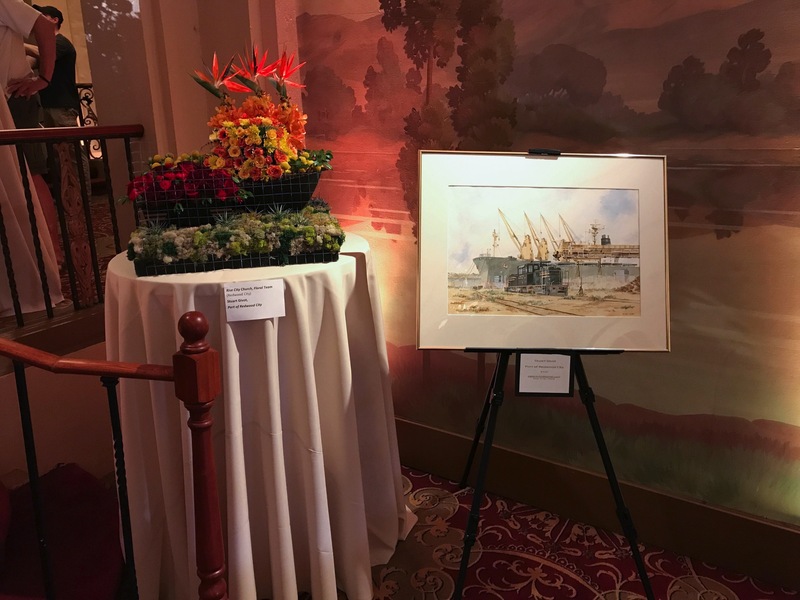 Throughout this calendar year Redwood City is celebrating its “sesquicentennial”—it’s 150th anniversary. The city picked 1867 as the official birth year because that is when Redwood City residents petitioned for incorporation (which wasn’t actually granted until March 27, 1868). The city was around for a number of years before incorporation, of course. The original plot map for the town that would become Redwood City was drawn up in the mid 1850s, and in 1856, when San Mateo County was created, Redwood City was chosen as the County Seat—so clearly Redwood City was well-known even before 1867. When we first arrived in Courthouse Square we noticed that the courthouse steps were largely covered with hydrangeas—which were looking somewhat tired from prolonged exposure to the hot sun. Not seeing much else in the way of flowers, we were just about to conclude that there apparently wasn’t much to see when a PA announcement directed us to the Fox Theatre, where the real action was taking place. If the cool, inviting interior of the theatre wasn’t enough to lure us in, the prospect of seeing the exhibition of flowers we had expected certainly was. And we weren’t disappointed! I’m glad we attended Saturday’s event, although I admit that the heat kept us from lingering as long as we might have liked. During the early afternoon, when we were there, the crowds were fairly light. I’m told that as the evening drew near the crowds picked up, and that the square filled up nicely. So the event appears to have been a success. If I am permitted to make a suggestion, however, next time there should be more and bigger signs pointing into the Fox Theatre. If it wasn’t for the announcer, we might have missed one of the central elements of the extravaganza! As for the hydrangeas on the Courthouse steps, those were being sold as a fundraiser for the GFWC Peninsula Hills Women’s Club. I know that they didn’t all sell on Saturday, but on the days that followed the club continued to offer them for sale; hopefully they managed to dispose of them all and raise a good amount in the process. Whether or not you were able to attend last weekend’s event, there will be other events throughout the year. Naturally there is a website dedicated to the 150th that lists those events; you can find it here. From comments made at Monday night’s City Council meeting it’s clear that the Council was pleased with the event. But about that meeting. Its primary focus was an appeal of the six-story, twenty-unit Habitat for Humanity condominium project that had previously been approved by the Planning Commission. I wrote somewhat extensively about this project back in March, in my post Habitats and History. At the end of that post I noted that the only real objections raised at the Planning Commission meeting were from a couple of lawyers who own and/or work out of three historic homes that share the block with the project, and that the project appeared headed for a lawsuit. It is indeed heading for a lawsuit, if the comments made by one of the affected lawyers can be believed. 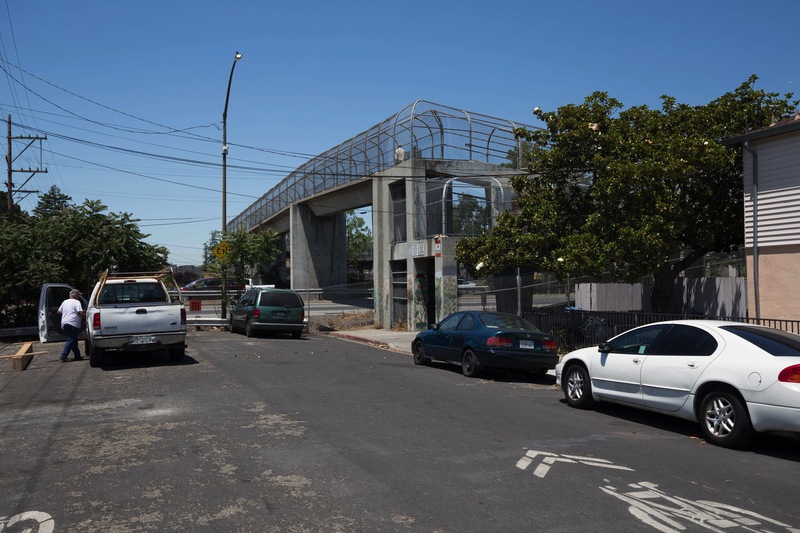 However, in my post I had neglected to note that, prior to filing a suit, the next step would be to appeal the Planning Commission’s decision to the City Council—which is why this project was on the meeting’s agenda. On Monday the Council received a report on the appeal from city staff, heard from the appellants (two of the lawyers who filed the appeal) and from representatives of Habitat for Humanity, and took comments from various members of the public, all before discussing the issue. Given the nature of the project, which aims to provide for-sale housing to low-income families and individuals, I wasn’t surprised to see that almost all of the public comments were supportive of the project. Indeed, the small number of objections were largely from people directly connected with one of the three historic buildings in the vicinity of the project. I was also not surprised to see the City Council members dismiss each of the claims made in the appeal and express enthusiastic support for the project. And as for the threatened lawsuit, more than one council member uttered the phrase “bring it on,” showing just how little merit they felt that there was to a suit. Unfortunately, though, I expect that a lawsuit will indeed be filed, and even if it comes to nothing the wasted time will likely cause the project’s costs to escalate. As I am not a lawyer I’ll refrain from predicting the outcome of the expected lawsuit, but whatever the verdict I hope it comes quickly so that, one way or another, we can move on. Somewhat related to this project is another that the city hopes will increase pedestrian safety and, perhaps more importantly, mobility. You likely have never tried to cross Woodside Road on foot, as I have, particularly at Middlefield Road. Costco, Orchard Supply, and Sigona’s are powerful draws, and many of us drive there without considering the challenges posed to those who don’t drive. There is a fairly large residential area just to the west of Woodside Road in the vicinity of Middlefield, but for those folks, who are mere blocks away from Costco, getting there without a car is very difficult. You may not have noticed, but this particular intersection is actually closed to pedestrians: they cannot cross either Woodside or Middlefield here. On either side of the over-crossing are a set of ramps that enable both pedestrians and cyclists to get up and down. Ramps are much better than stairs for accessibility reasons, but these ramps are surprisingly steep. An able-bodied pedestrian such as myself will have no trouble with them, but I feel for anyone in a manually operated wheelchair or someone pushing a full shopping cart. Fortunately, the city has recognized that this over-crossing, although helpful, is not an adequate solution to the problem of getting across Woodside Road at Middlefield. To that end, by mid-summer they plan to break ground on a project that will add four crosswalks to the intersection along with additional sidewalks (there aren’t any at this intersection, currently) and curb ramps, plus pedestrian-activated signals and roadway lighting. The entire project should take about a year. Personally, I can’t wait! And based on the number of people I encounter whenever I’m walking in this area, I know I won’t be the only one applauding when the new crosswalks are finally opened to the public. 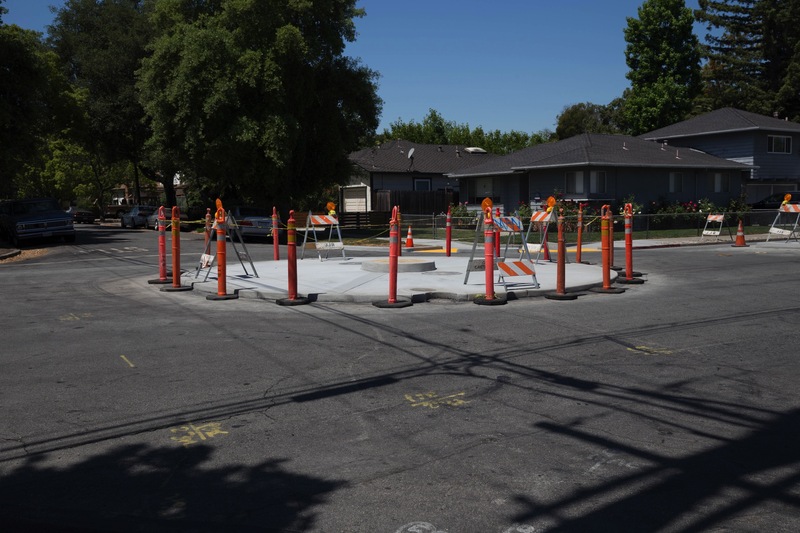 Although Redwood City is already a fairly pedestrian-friendly place, I am delighted at the number of projects that the city is undertaking to improve walkability. From the variety of changes being made to Hudson, to the reworking of the Woodside/Middlefield intersection, to the various “Safe Routes to School” projects, to the Highway 101 pedestrian under-crossing (that basically goes from Toys ‘R Us to the new Courtyard Hotel out on 101), Redwood City is working to make it easier for pedestrians and cyclists to get from here to there.